Unitomo continue to increase international cooperation Fri, at (12/12) campus is located in the area is visited semolowaru Director General of Japan Foundation (Mr. Kanai Atsushi). Kedatanganya is a follow-up plan of sending one of his apprenticeship as a lecturer from Japan that are part of the Genesis program. in several cities in Indonesia JABODETABEK among three people, 1 person Jabar, a Central Java, East Java 1, Bali, one person, one person Riau, North Sumatra and one Sumbar one. 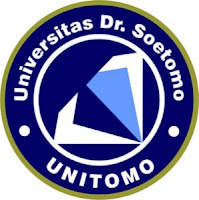 To Jatim planned to be in place in Unitomo, said Atsushi saaat in the meet in the room Unitomo Rector. Native speakers are coming, to be provided in addition to Japanese, will also provide a range of cultural information. 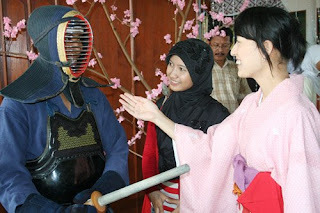 Thus can diharapakan of cultural exchange between Japan and Indonesia. “We are very interested in learning culture Indonesia. Surabaya city itself is quite familiar to us,” augment him. Head of the Department of Japanese literature Unitomo Hendri Zuliastuti say allow native speakers to be Unitomo value plus for students and the community Jatim who want to develop the Japanese language. Also hopes his side can show the Japanese culture with various, such as musical instruments, dance, art and self-care. “The coming of native speakers and add the horizon of students and this is an advantage for Unitomo,” augment him. Keren…Aku kangen sama Shimizu Sanae yang pake yukata itu. Xixixixi…. arigatoo gozaimasu node watashiwa mada unitomo no nihon daigaku no tomodachi o naru koto ga dekimasu .